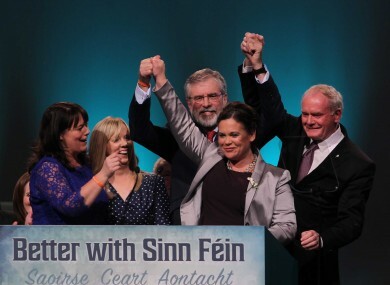 SINN FÉIN MEMBERS gathered in the Dublin Convention Centre this weekend for the party’s annual Ard Fheis. With this year marking the centenary of the 1916 Rising – it was no surprise that this year’s event centred around the Irish Proclamation, a united Ireland and reconciliation. There was lots to discuss and lots of talking points that emerged. The words Tweedledum and Tweedledee featured in quite a few speeches this weekend. Mary Lou McDonald called the establishment parties “the old guard politicians” who are holding the Dáil to ransom. Gerry Adams said it was time for the two parties to “sort it” and get on with forming a government or go back to the people. The deputy leader is known for being a powerful speaker – and she didn’t waste the opportunity today. The party packed literally dozens of delegates into its two hours on RTÉ One between 11am and 1pm today in an attempt to get them some national exposure. Donegal TD Pearse Doherty gave a strong speech on how those dealing with economic policy cannot forget the people behind the numbers. They are policies that recognise that it not possible to cut taxes and cross your fingers and hope that everything works out ok, which is what Fine Gael and Fianna Fáil want to do. Or leave all things to the market , when there are some things that the market sees as commodities to be bought and sold regardless of long-term social and economic consequences. You cannot treat a hospital bed the same way as a mobile phone. You cannot have an economic policy that treats social cohesion as something that just gets in the way. The problems we face as a people are far too great, they run way too deep, to be fixed with such empty and futile gestures as tax credits and modular homes. 4. There was some serious song, dance and craft at the Ard Fheis. Before Gerry Adams took to the stage, there was a play, poetry, Bobby Sand diary entry readings and Irish music to boot. Hand-made tapestries lined the Convention Centre walls. Each patch representing a person who had died during the conflicts in Northern Ireland. A Sinn Féin voted in favour of establishing a 32-county soccer team. A party delegate addressed the conference and called for a all-Ireland soccer team, saying that a ”uniting team shows solidarity to people in need”. It’s every Dublin boy’s dream to play for Ireland, lets make it every Belfast boy’s dream to play for Ireland too. Throughout the Ard Fheis and coinciding with 1916 commemorations, the overriding theme was the partition and the reunification of Ireland. In a speech that received a standing ovation, McDonald described partition as the “elephant in the room”. Erica Fleming, who took part in an RTE documentary about being homeless with a young child, struck a chord with everyone in the auditorium today. Today – as I stand here before you – myself and my 9-year-old daughter have been homeless for 298 days. That is 298 days living in what the outgoing government like to call ‘temporary accommodation’ – 298 days is not temporary. I exposed our lives, I exposed the hardships of being a homeless working lone parent. I exposed the hardships of being a homeless child. I exposed how unfair the system was and is towards us. There were pins, posters, framed photos of the 1916 leaders, t-shirts and Irish Proclamations to be bought – not to mention these ‘Rising’ mugs. 9. Sinn Féin haven’t let go of the idea of getting another bank holiday – 24 April. The party want 24 April, the actual date of the 1916 Easter Rising – which is also incidentally Taoiseach Enda Kenny’s birthday – a national public holiday every year. They already tried to get it through last year, but the government voted down the motion. It’s whole other political ball game one year on, so maybe it will be a case of second-time lucky. Email “9 things we’ve learned from the Sinn Féin Ard Fheis”. Feedback on “9 things we’ve learned from the Sinn Féin Ard Fheis”.